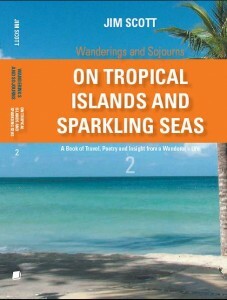 Written as the secondof the “Wanderings and Sojourns” series, this book mostly covers the decades of Jim Scott’s wanderings spent either at sea or in the Islands of the Caribbean. 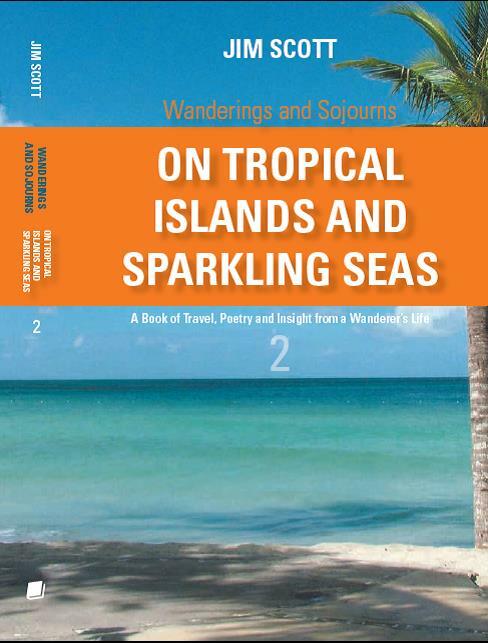 It comprises 24 true stories based upon the author’s own experiences and adventures but, unlike most books of its kind, adds pause for philosophical reflection at the end of each. Also included are many original works of lyrical verse complimenting the stories, several of which are included in the much larger collection of songs and verses in book 3. as well as a couple in the series introductory book 1. As with all the books in the series this one covers many disparate themes from a wanderer’s unusual life. Book 2 embraces everything from desperate sailboat racing to treasure hunting to pirate defense to hurricane response to chartering stories and much, much more. Unavailable at this time as book not yet on sale. Refer to other areas of this website for readers’ reactions to other books in series. To actually sit down and put it together took longer than planned as I had to put it aside for a while to prioritize other matters happening around me…. to actually write it, not long because most of the stories were already written in one form or another. But to live the stories, that is to say to do the research, the book covers around 30 years of adventure so you could say it took that long to come to fruition. All from my own experiences. They all really did happen, although for the sake of brevity and to help the reader contextualize some have been tweaked while others are an amalgam of more than one story. The poems, of course, are poems and not necessarily true stories although their seeds had to be sown by something in my life. Book 3 “The Songs and Verses” a compilation of 80 original poems and songs, is already published. Book 1 “On Five Continents and Three Oceans”, is also out there and I have started writing book 4 which will be focused on my years and travels in the Iberian Peninsula. After that …… well, there’s still many more parts of the world, experiences and adventures about which to write, and many more yet to be lived. I believe there could easily be an African volume in the works as well as a South American one and I am starting to write fictional stories as well inspired by real events in my wanderings that may fit this series or may become a series of their own.